To those following the vaginal mesh controversy, Boston Scientific will always play an important role having been the company that produced Protegen, the original pelvic mesh which was used as predicate device for succeeding vaginal mesh products under the Food and Drug Administration’s (FDA) 510(k) prenotification process. It reportedly recalled the product after only two years in the market and settled more than 700 complaints from women who suffered severe complications. Boston Scientific is once again in the limelight with the huge number of vaginal mesh lawsuits filed against the company, with the first bellwether trial scheduled for early 2014 in a West Virginia multidistrict litigation (MDL). This Massachusetts-based company was able to penetrate the urogynecological market after its Protegen fiasco with a new set of mesh products. It has been reported that these new products were made available to the market under the FDA’s 510(k) prenotification process using other mesh devices whose clearance may be traced to the recalled Protegen sling as predicate device. Mesh products carried by Boston Scientific include the Advantage Fit Transvaginal Mid-urethral Sling Systems, Pinnacle Pelvic Floor Repair Kit, Obtryx Transobturator Mid-Urethral Sling, Lynx Suprapublic Mid-Urethral Sling System, Prefyx PPS Sling System and the Solynx SIS Vaginal Sling System. Patients who have been implanted with these mesh products have reported serious injuries as a result of complications attributed to these devices. Among the severe complications experienced by thousands of women using these products are mesh erosion, mesh shrinkage, dyspareunia, infections, and recurrent pain. These injuries which have led to great pain and suffering have prompted these women to take legal actions against Boston Scientific. As of October 11, 2014, there are 6,580 vaginal mesh lawsuits pending before the US District Court for the Southern District of West Virginia under Judge Joseph Goodwin. This does not include the other claims brought before various state courts in the country. In his court order released on October 9, 2013, Judge Joseph Goodwin has set March 10, 2014 as the date of the trial for the first bellwether case involving Boston Scientific on a claim filed by Carol Lynn Fawcett. The second bellwether trial is slated to start on July 14, 2014. Court records will show that in just nine days between October 1 to 11, 2013, 219 additional vaginal mesh lawsuits were submitted. 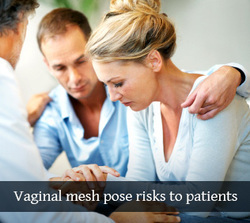 This number is expected to increase further in the coming months as more women injured by vaginal mesh devices, such as those made by Boston Scientific, start exercising their legal rights. ATLANTIC CITY, N.J., Feb. 28, 2013 /PRNewswire/ — A New Jersey state court jury has awarded more than $11 million in combined compensatory and punitive damages to a woman claiming Ethicon’s Prolift vaginal mesh implant caused her to suffer serious, debilitating injury, according to sources from the Rottenstein Law Group, which maintains a website on mesh lawsuits designed to provide mesh recipients with information and help them evaluate if they have a case. Concluding the first trial of one of approximately 2,000 personal injury cases pending in New Jersey Superior Court involving the Prolift vaginal mesh kit, the jury awarded the claimant, 47-year-old Linda Gross , $3.35 million in compensatory damages early this week. (Gross v. Gynecare Inc., Atl-L-6966-10, Superior Court of Atlantic County, New Jersey). The jury then reconvened to consider the possibility of punitive damages and announced the $7.76 million punitive damages award this morning. The jury’s damage awards, which total $11.1 million, are based on its finding that Ethicon failed to provide an adequate warning to Gross’s implanting surgeon, and on the jury’s finding that the Prolift’s instructions for use and marketing materials fraudulently misrepresented the product’s risks. (Attorney advertising. Prior results do not guarantee a similar outcome.) A federal court in the Southern District of West Virginia ordered Boston Scientific to turn over documents relating to the company’s recalled ProteGen sling as part of a multidistrict litigation related to a transvaginal mesh lawsuit. Plaintiffs in the case (MDL #2326 In re: Boston Scientific Corp. Pelvic Repair System Products Liability Litigation) argued that the documents would reveal Boston Scientific knew about the incompatibility of a woman’s pelvic biology with ProteGen’s polyester mesh, according to court documents. The ProteGen is made of a polyester woven sling, coated with pressure-injected bovine collagen and part of a Vesica sling system that also contained bone anchors. The Rottenstein Law Group is encouraged by the order, and maintains a website at http://www.vaginalmeshlawsuitcenter.us for the benefit of women who want more information about vaginal mesh risks and vaginal mesh lawsuits. The site contains vital information and easy-to-use social media features that allow for easy sharing on sites like Facebook and Twitter.